The DEMCiflex magnetic dust filter set is custom made to be a perfect fit for the NZXT Phantom 410 case. 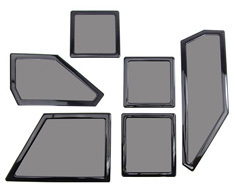 This 6 piece set includes filters for the front, top, side, rear, as well as the bottom fans. All filters features magnetic adhesion for easy removal and cleaning of the re-usable, plastic filter.